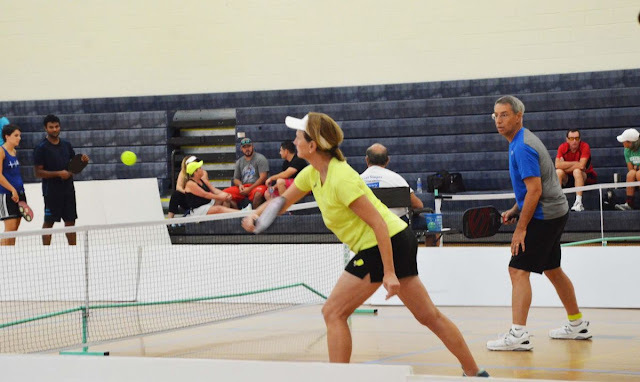 The Palmetto Indoor Pickleball Doubles International is being held at the H. Odell Weeks Activity Center this weekend and has women's doubles, men's doubles, and mixed doubles. Saturday's games were part of the mixed doubles tournament. The sport of pickleball was started in 1965, and Keith Shaver, one of the tournament directors, said that while the game started with older people playing, younger demographics have picked it up and estimates are that about three to four million people are playing. He said that pickleball is considered the fastest growing sport in the country. There is an intramural program at USC Aiken and schools are introducing pickleball into their gym classes.